The forbidden OTCs tab contains all Over-theCounter (OTC) medication that a Camper or Staff members may not take. 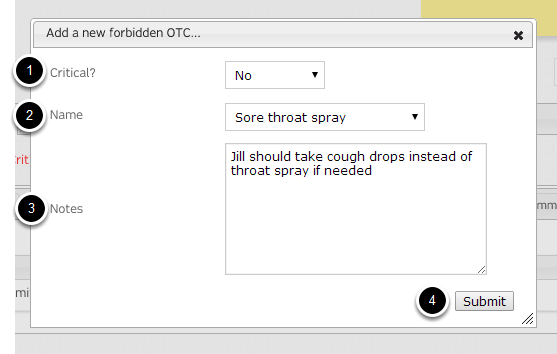 Forbidden OTCs can be marked as critical by your health center staff double-clicking the flag icon so it turns red. To mark a forbidden OTC as critical, double click the flag icon until it turns red. To add a new forbidden OTC, select "+Add a new forbidden OTC..."
The new forbidden OTC has been added to the list.